Iraq's army said on Sunday it had defeated Islamic State fighters in a provincial capital west of Baghdad, the first major victory for the U.S.-trained force since it collapsed in the face of an assault by the militants 18 months ago. By Ahmed Rasheed for Reuters. BAGHDAD, Dec 27 (Reuters) Victory in Ramadi, capital of mainly Sunni-Muslim Anbar province in the Euphrates River valley west of the capital, deprives Islamic State militants of their biggest prize of 2015. The fighters captured it in May after government troops fled in a defeat which prompted Washington to take a hard look at strategy against the militants. Television also showed nighttime celebrations in mainly Shi’ite cities south of Baghdad, for the victory in Anbar, with people dancing in the streets and waving Iraqi flags from cars. Officials did not give any immediate death tolls for the battle. The government says most civilian residents of the city were able to evacuate before it launched its assault. A U.S.-led coalition has been waging an air campaign against the fighters in both countries, but rebuilding the Iraqi army to the point that it was capable of recapturing and holding territory has been one of the biggest challenges. In previous battles, including the recapture of former dictator Saddam Hussein’s home city Tirkit in April, the Iraqi government relied on Iran-backed Shi’ite militias for ground fighting, with its own army in a supporting role. 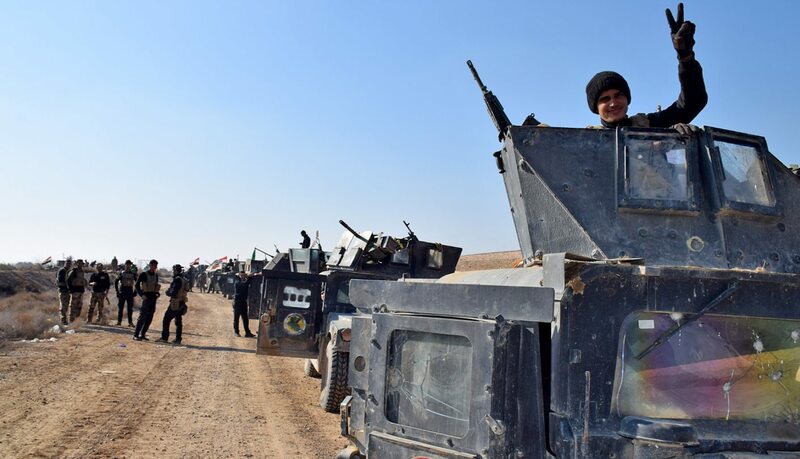 Ramadi was recaptured by the army itself, without relying on the militias, who were kept off the battlefield to avoid sectarian tensions with the mainly Sunni population. “The complex is under our complete control, there is no presence whatsoever of Daesh fighters in the complex,” Numani told Reuters. The government said the next target after Ramadi will be the northern city of Mosul, by far the largest population center controlled by Islamic State in either Iraq or Syria. “The smooth victory in Ramadi should be happy news for the residents of Mosul,” Numani said. U.S. officials had hoped Baghdad would launch an assault on Mosul during 2015, but this was put off after the fighters swept into Ramadi.